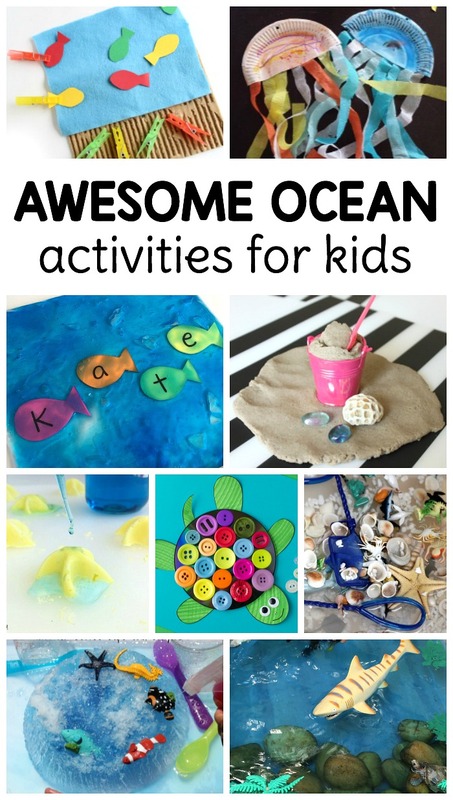 We live so close to the ocean, so all of the under the sea and ocean activities that I come across seem extra fun to plan for my preschoolers! I have put together the ultimate list of awesome ocean activities for preschool and kindergarten. You can easily add these to your science area, craft time, sensory bin, and fine motor play area. These ocean activities are great for home too! Strengthen fine motor skills with this Color Matching Fish Busy Bag from Coffee Cups & Crayons. Get creative with an Under the Sea Invitation to Create from What Can We Do With Paper & Glue. Magnetic play in this Felt DIY Magnetic Fish Game is always a hit from Natural Beach Living. Kids will love this easy peasy Jellyfish Craft from My Bored Toddler. Use dotters with this Dot Marker Art craft from Rainy Day Mum. Use an old CD to create the this Turtle Craft from Fireflies and Mud Pies. Make this Cute Paper Plate Crab from Crafty Kids at Home. Become a shark with this Shark Fin Hat Craft from Glue Sticks & Gum Drops. Save your egg cartons for these Ocean Animals from Homeschool Preschool. This Rocking Paper Plate Submarine is so much fun over on Red Ted Art. Set up some water play with this Star Sensory Bin. Check out this Shark Sensory Bin from Mommy’s Bundle. This Shark Sensory Bottle is perfect for little ones from Stir the Wonder. Use your water table for this Beach Sensory Play and Small World from Fantastic Fun & Learning. Love the fish nets used in this Ocean Sensory Bin from Teaching 2 & 3 Year-olds. Practice letters in your name with the Ocean Recognition Sensory Bag. We are loving this Sparkling Ocean Play Dough from Stir the Wonder. This Sand Play Dough with Loose Parts looks so real from Mama. Papa. Bubba. Set up this Ocean Ice and Salt Experiment from Coffee Cups & Crayons. Set up an Ocean Themed Science Table from Natural Beach Living. These Frozen Sea Stars are so easy to make and so much fun. Find out the Size of a Blue Whale from Edventures with Kids. You will love the How Sharks Float Experiment over on Preschool Powol Packets. Create your own Tide Pool Experiment from Buggy and Buddy. 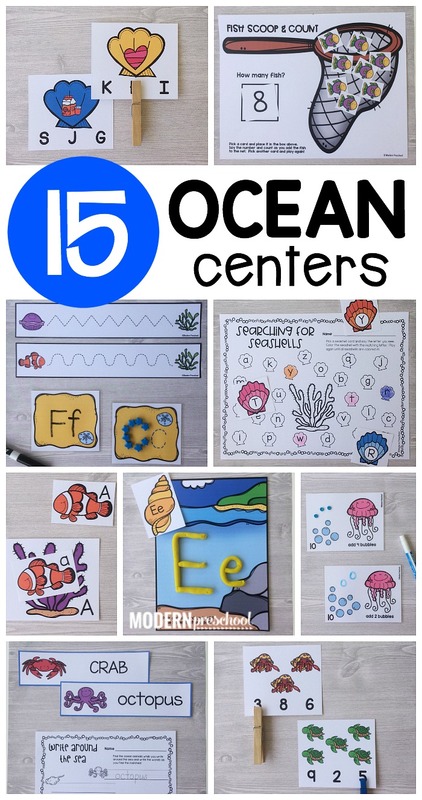 All of these ocean themed activities are perfect additions to use along side our Ocean Literacy & Math Centers. They take no time to prep and are all in one place so you can stop searching Pinterest trying to find ocean learning activities on a whole bunch of different sites! Just print, prep, and play. Your ocean theme is planned for you!